In many aspects current politics is a case of history repeating. 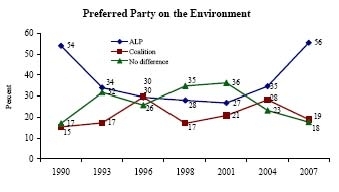 Labor’s current political woes are reminiscent of the last days of the Keating Labor government, environmental politics had been an important component of Labor’s electoral success in the 1990 election and to a degree at the 1987 and 1993 elections (graph is from Australian Election Survey summary report). However Keating had little interest in environmental politics and by 1995 the ascendant forces within the Labor government were dismissive of Labor’s past flirtation with green politics. The Labor government became entangled over in a messy controversy after levels of wood-chip exports and succeeded only in alienating both the timber industry leading to a loggers’ blockade of parliament and also many environmentalists, compare to how with the ill defined postponment of the ETS Labor has ended up displeasing everybody. In 1995-96 the Coalition bolstered its environmental credentials and wooed The Wilderness Society. In 1996 voters saw little difference between Labor and the Coalition on environmental policy, just as they may in 2010. Labor’s uncertainty about environmental policy reflects fundamental divisions within the party. 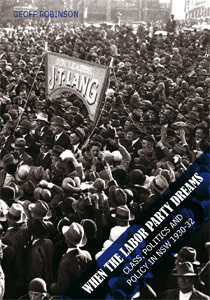 The 2007 ANU survey of Australian election candidates sheds light on this, 45.7% of labor candidates strongly agreed that there should be more environmental protection, but only 10.5% of Coalition candidates and 96.5% of Green candidates, 47.4% of Coalition candidates have milder agreement as did 53.1% of labor candidates, 9.2% of Coalition candidates disagreed or strongly disagreed with more environmental protection. Labor is more divided about environmental policy than either the Greens or the Coalition. History is also repeating itself in the case of Coalition strategy. The Coalition in the late 1990s espoused a particular conservative appeal to environmental sentiment that rhetorically prioritised land management and biodiversity as ‘non-political’ causes (for a critique see Tim Doyle’s Green Power). Now we see the Coalition seeking to exploit popular fears of the environmental consequences of population growth attributed to immigration, the objective here is to drive a wedge between ‘small green’ public opinion and the organised environmental and Green movements (American conservatives are attempting this also). In government this will be difficult to deliver upon. The Coalition has promised to rebadge the Productivity Commission as a Productivity and Sustainability Commission charged with the task of developing population targets. The Productivity Commission would take on the nation-moulding responsibilities that the Arbitration Commission once fulfilled (once the Americans had antitrust and we had industrial arbitration). Yet consensus on population may prove as difficult as consensus on wage levels. 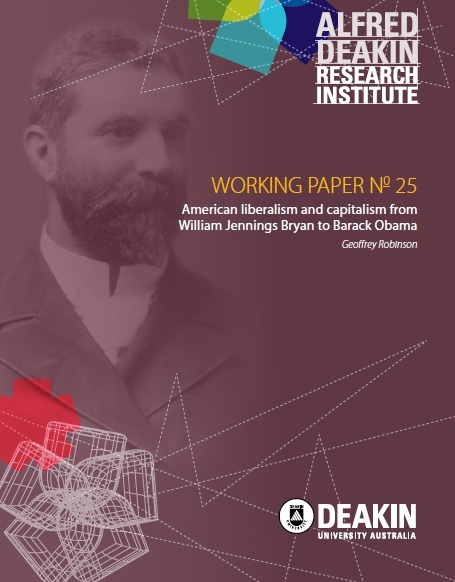 Back in 2002 CSIRO Sustainable Ecosystems prepared a report for the Department of Immigration and Multicultural and Indigenous Affairs entitled Future Dilemmas: Options to 2050 for Australia’s population, technology, resources and environment. The report reflected the scepticism of many physical scientists about population growth but was criticized by many economists as unduly pessimistic: see the comments of Chris Murphy and Mark Wooden who were brought in as external reviewersbefore the release of the report and whose dissent was included in the final report. Four Corners reported on the argument in 2002. I suspect that if the Productivity Commission ever finds itself lumbered with a population policy task it will struggle.